but fo’ reals this salad really is my idea of the perfect summer lunch or dinner salad, and I think if you give it a try you’ll have to agree! besides prepping your veggies and making a simple salad dressing there’s not much else to it. which of course, leaves you with more time to go jump in that lake after dinner! a bowl of crisp shredded romaine lettuce starts everything off just right here, (which! side note! very important news flash – this lettuce is super nutrient dense! right up there with spinach and kale. I will no longer feel ashamed for my love of caesar salad! 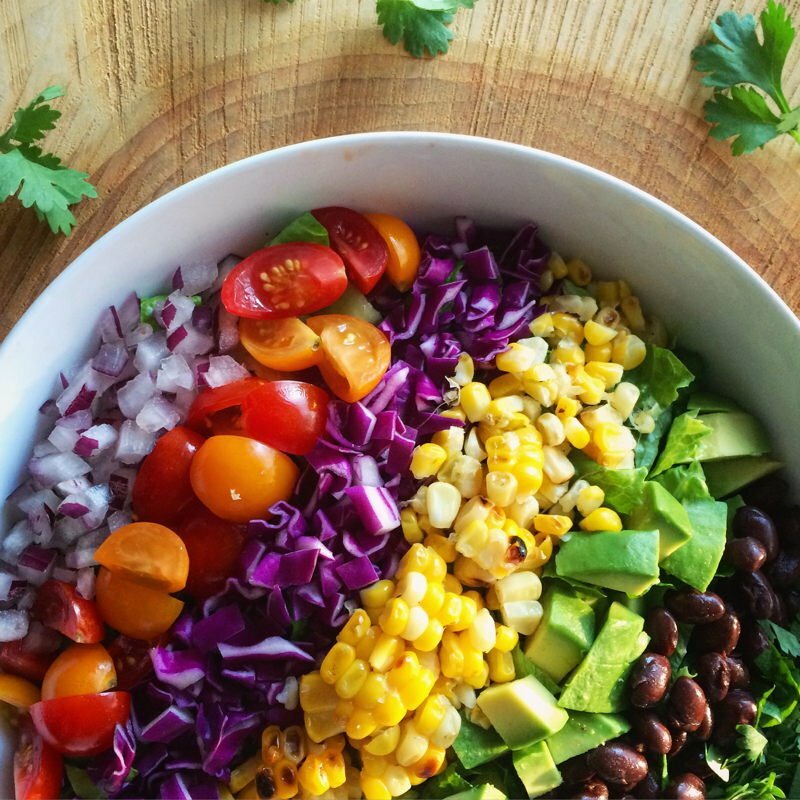 [source]) and is then piled high with pretty rows of your favorite mexican themed veggies, black beans, avocado and chopped cilantro. I chose to take full advantage of the deliciousness of that roasted red pepper & harissa vinaigrette that’s hanging out in the blog archives to dress this salad, although I’m pretty sure the dreamy green sauce would also be a very solid choice. just depends if you’re in a red food mood or a green food mood. you guys have those too, right? anyways…after you pick your dressing you’ll want to add some cotija cheese, or cow’s milk feta, and toss it all together until it’s perfectly coated and dazzling at you with all of it’s healthy-rainbow-beauty! grab your forks friends! I really don’t think you want to miss this one! 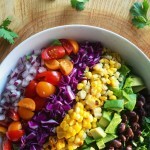 a healthy chopped mexican rainbow salad with a wide array of summer veggies, and some avocado and beans to balance everything out. fill a large serving bowl with your chopped romaine lettuce. top with all remaining ingredients except cheese and dressing. I love the look of “rainbow” rows of veggies – it makes such a beautiful and appealing presentation! this step can be done a few hours in advance of serving if salad is stored in the refrigerator. once you are ready to serve add cheese, dressing, and toss everything together until evenly coated. taste for salt and pepper. serve in individual bowls garnished with a little more cotija or feta cheese. you might wanna throw a bowl of organic tortilla chips on the table too just to elevate the whole mexican salad experience 😉 I would be lying if I said I didn’t do just that! This entry was posted in salads on August 1, 2015 by Nyssa Tanner.